Why does 'nuclear' scare us so much? 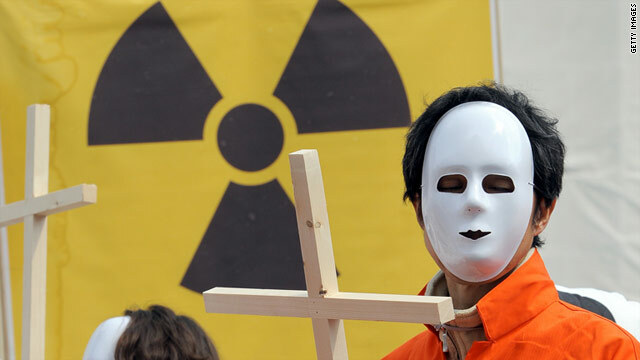 South Korean environmental activists demonstrate to oppose nuclear power in Seoul on Monday. Dr. Drew Pinsky is coming to HLN with a new nightly show discussing extreme human behavior, with a focus not on what happened, but why it happened. The "Dr. Drew" show premieres Monday, April 4, at 9 p.m. ET/PT on HLN. (CNN) -- Say it aloud: NUCLEAR. How does it make you feel? Many people have negative associations with the word, feelings that have been magnified since a massive earthquake and tsunami crippled a power plant called Fukushima Daiichi in Japan on March 11. Health authorities continue to emphasize that the minuscule levels of radioactivity drifting over from Japan to the United States will not even come close to harming human health. These are trace amounts, and not anything any of us should worry about. Yet plenty of the worried on the West Coast ran out to buy potassium iodide to counter the effects of radioactive iodine, even though there's not nearly enough of this substance in the air to affect human health. And taking potassium iodide unnecessarily can come with its own harmful side effects. If there's no real danger to Americans in the U.S., why the fear? People generally think about risk from an emotional perspective, rather than from a rational one, says Richard John, associate professor of psychology at the University of Southern California. Here's how you actually calculate risk: Multiply the probability of a consequence by the severity of the consequence. But if you ask people how risky something is, it probably won't match up with that calculation. They'll go with their intuition, or gut feeling. Paul Slovic, professor of psychology at the University of Oregon, did a study back in the 1990s looking at what people associate with nuclear power. He and colleagues found that a high percentage of people thought of bombs and other weapons. "That association is still in many people's minds and colors the reactions to nuclear power to a certain extent," Slovic said. Some say our aversion to nuclear energy goes further back than that. In his book "Nuclear Fear: A History of Images," historian Spencer Weart argues that the way we think about nuclear energy has roots from even before radioactivity was discovered in 1896. Early alchemists, for example, were interested in transmutation, which Weart defines as "the passage through destruction to rebirth." Ideas about transmutation and doomsday scenarios came together and bubbled up around the potential dangerous of too much radiation, Weart says. "By the 1930s most people vaguely associated radioactivity with uncanny rays that brought hideous death or miraculous new life; with mad scientists and their ambiguous monsters; with cosmic secrets of death and life; with a future Golden Age, perhaps reached only through an apocalypse; and with weapons great enough to destroy the world, except perhaps for a few survivors," Weart writes. The atomic bombings of Hiroshima and Nagasaki confirmed this structure of hopeful and fearful images, and made such ideas prominent, he writes. Distrust grew into the early 1960s, with nuclear authorities regarded as "dangerous men not unlike mad scientists." A movement broke out against nuclear reactors in the 1970s, coupled with a fear of bombs. "Nuclear power was this notion of something that was associated with death," John said. Then came Chernobyl, in 1986, the world's biggest nuclear disaster, which further damaged perceptions of nuclear power. Today, people commonly go for diagnostic scan procedures called MRIs, but the technique was originally called "nuclear magnetic resonance imaging" or NMRI, with the first human testing in the 1970s. But because of this history of bad associations, "nobody wanted to get into a machine called a 'nuclear' anything," John said. Familiarity with a risk is one part of your perception of it, John said. Something that's relatively unknown to you will seem more dangerous than something that you've had a lot of exposure to previously. For many people, nuclear power and its workings are unfamiliar, he said. Funnily enough, radiation should be familiar to everyone, since it's everywhere. Radiation is all around us, from the sun and space and other natural sources. And radioactivity is employed routinely in medical procedures, such as X-rays and cancer treatments. But the awareness that radiation can lead to the dreaded consequence of cancer makes us feel bad about exposure from nuclear power plants, John says. Here are some real numbers for you: 10,000 people will have died of cancer a result of Chernobyl, the world's biggest nuclear accident, according to some estimates. But coal plants' pollution was expected to cause nearly 13,200 deaths in 2010, not to mention 20,000 heart attacks per year, according to the nonprofit Clean Air Task Force. "We're talking about one invisible way of dying early -- by cancer, in Chernobyl -- versus another way: fine particulate air pollution," said Frank N. von Hippel, a nuclear physicist and Princeton University professor. So, which are you more afraid of: nuclear power or coal? And while the Fukushima Daiichi power plant situation isn't yet stabilized, keep in mind that the death toll for the March 11 earthquake and tsunami has risen above 10,000, and no one has died of radiation sickness. Are you there? Share your photos and videos if you can do so safely. Rather than worrying about what radioactivity will come to the U.S., "it's more important that we help the victims from the tsunami and the earthquake right now," said Peter Hosemann of the nuclear engineering department at the University of California, Berkeley.